I stopped at Starbuck's this morning for an Eggnog Latte. Today is not only Friday, but I have a break from work until January 4, so I'm feeling quite cheerful about that. 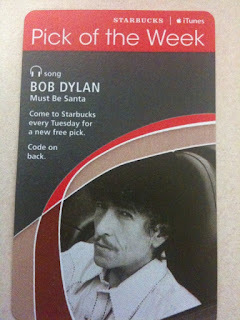 As I was waiting for my latte, I noticed a stack of cards advertising "Pick of the Week" - a free service Starbuck's offers through Itunes. I'm not sure, but it seems they offer the songs no one would want for freebies. This week's pick? "Must Be Santa" by.......Dean Martin? Nope. Frank Sinatra? Nope. Rosemary Clooney? Nope. Bob Dylan? Er.....you got it. Grainy voiced, barely carry a tune, great for deep blues type music Bob Dylan. If Santa were a skidrow bum, beard grimy with dirt from sleeping face down all night on a filthy sidewalk, clutching a cheap mostly empty bottle of ripple.......Bob Dylan MIGHT be the appropriate choice for "Must Be Santa". Since I can't recall the tune or lyrics of this song, perhaps it IS about a reprobate Santa, discovered by Mr. Dylan as he stumbles over one of the black boots stretched out on the sidewalk and rolls the passed out drunk over, only to find.......it Must Be Santa!!! I have thought the same thing after seeing surprising Christmas CDs from people I'd never expect. Can't you just imagine Bob D. singing Rockin' Around the Christmas Tree?